Tablets may drive consumers wild, but that fever hasn't hit the workplace yet, according to a survey conducted by Forrester Consulting at the behest of Dell and Intel. The February survey asked IT decision makers to choose the two work devices that would make them most productive, and PCs and smartphones come out on top for IT managers. Apple's iPad has taken a bite out of PC sales, laptops in particular. And another recent survey showed people spending more time on their tablets than on their desktops or laptops. That prompted HP and Dell to start trash talking the iPad. 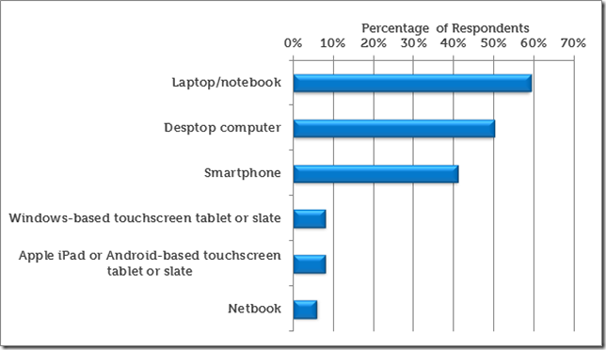 But all that talk about tablets killing the PC, though, doesn't apply to the enterprise. Businesses have yet to throw out their workstations and replace ThinkPads with iPads. Rather, as Dell's IT Executive blog post asserts, tablets "can replace paper-based systems and introduce new productivity places, but this only makes them a companion device, not a replacement for existing PCs." Moreover, while tablets bring benefits to the workplace, they're also a headache for IT managers. In addition to the survey that placed PCs and smartphones on top, 58% of IT pros said the growing number of devices to support and the cost of deployment were their biggest tablet management concerns. The blog post concludes that "the PC is not dead" - at least in the enterprise. While it's an obvious statement and may seem like Dell's preaching to the choir, the research may be comforting to enterprise-centric manufacturers Dell and HP.